Bringing its schedule up from later in the year, the Light to Night Festival returns from 19 to 28 January 2018 and is set to paint Singapore’s Civic District in a dazzling array of colours, transforming iconic cultural institutions and parks into spectacular works of art. In its second edition, the Festival will expand from the National Gallery Singapore to become a precinct-wide arts festival, together with four other precinct partners – The Art House, Victoria Theatre and Victoria Concert Hall, Asian Civilisations Museum and The Esplanade. Themed ‘Colour Sensations’, the Festival will take you on a captivating, multi-sensorial journey through the changing colours of the precinct from day to night. You can look forward to a vibrant kaleidoscope of public art and activities by artists from Singapore and beyond. As they bring about interactive light projections, immersive colourscapes, illusionary mirror-play, and participatory indoor works and performances that span seven programme zones – making it the largest precinct-wide visual, literary and performing arts festival in Singapore. Watch the Civic District turn into a nocturnal wonderland when the sun goes down, as revellers are spellbound by the illuminated city streetscapes. For the first time, National Gallery Singapore’s City Hall façade will become an interactive canvas for anyone to create public artwork. Titled Chromascope, all are invited to participate by stepping on stomping pads to project coloured visuals onto the Gallery’s façade. On top of that, the biggest façade light extravaganza in Singapore – Art Skins on Monuments – will feature coloured light projections on the façade of these cultural buildings by 30 Singapore and Singapore-based artists, illustrators and multimedia designers, including new media artist Brandon Tay, visual artist Speak Cryptic, illustrator-artist Aeropalmics and contemporary artist Samantha Lo. On the Empress Lawn, a multi-sensory adventure awaits as House of Mirrors by Melbourne artists Christian Wagstaff and Keith Courtney makes its Asian debut. A thrilling blend of both delight and paranoia, enter a labyrinth of endless mirrors which takes you on a journey through thousands of disorientating optical illusions and bewildering reflections – all while taking in the open night-sky above. 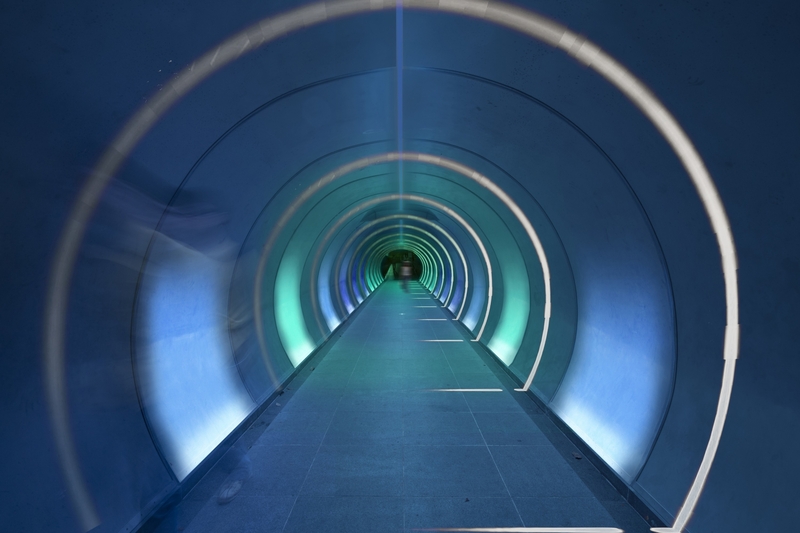 Move on to the Esplanade Park tunnel as Singapore-based lighting design collective Nipek presents Trip to the Colourscape, a display of vibrant hues aimed at stimulating one’s awareness of our environment through the interplay of coloured lights and shadows. This experience will be enhanced with musical performances at the Esplanade Park by local bands such as Cosmic Child and Sang Mataharitidur Mati. Additionally, Year 1 students from the National University of Singapore’s Architecture faculty will be presenting a new site-specific installation, Art Incubator: Tropical Primitive Hut, which will take centre stage at the ACM Green. This interpretation of the primitive hut explores the natural connections between people, architecture and the environment that may often be overlooked during Singapore’s rapid urban development. A Stitch in Time by Filipino artist David Medalla is an expansive sculptural work that was inspired by his chance reunion with a handkerchief that he had gifted to an ex-lover years earlier. You are encouraged to stitch words or small memorabilia onto the canvas as a display of interconnectedness and accidental discoveries. The UOB Southeast Asia Gallery will also see an internationally-acclaimed performance work by Taiwanese artist Lee Mingwei – Sonic Blossom, which reminds one of the fragility of life and the moments that make it beautiful. In the live one-on-one performance, a classically-trained opera singer will approach one guest at a time in the galleries to perform a personal short rendition of Lieder (art songs) by Franz Schubert. The two works will accompany three other commissioned pieces – One or Several Tigers by Singaporean artist Ho Tzu Nyen, The House is Crumbling by Thai artist Pinaree Sanpitak, and Walk, Walk, Walk: Search, Deviate, Reunite by teamLab – and an existing work by teamLab, Flowers and People – Dark, which have been progressively opened to the public since December, to encourage one to also experience the museum as a space for people to gather and interact. Starting from 5pm till midnight on weekends (Fri & Sat). While visitors can still enjoy the outdoor light art installations from 8pm till 10pm on weekdays (Sun – Thurs). The installations inside National Gallery Singapore follows the institution’s opening hours, except Friday and Saturday when it will close at midnight. Furthermore, St Andrew’s Road will be closed during the two weekends on Friday and Saturday from 4pm till 1am. Get ready for endless evenings of fun and enjoyment with more than 30 programmes in these 10 days. For more information about the Festival, visit www.lighttonight.sg and we’ll see you there!